It’s not often that I write here about something completely unrelated to real estate, but the following story form yesterday’s Washington Post was brilliant in both its recommendations and simplicity to reform our country. A healthy democracy must make fresh choices. This requires not mindless deregulation but continual adjustment of laws. Congress could take on this responsibility if it followed a simple proposal: Every law should automatically expire after 10 or 15 years. Such a universal sunset provision would force Congress and the president to justify the status quo and give political reformers an opening to reexamine trade-offs and public priorities. There is one common technique that has been used in successful legal overhauls, from Justinian’s recodification in ancient times to the Napoleonic code that is the basis of modern European civil law to the uniform commercial code adopted in the United States in the 1950s. The technique is this: radical simplification. Someone I know is rying to get an appointment at UVA Medical Center and is faced with a three month wait. I mentioned this on Twitter and found that this type of wait is common; respondents mentioned waits ranging from three to eleven months. What country are we in? The political debate skims the top of this vast legal pile, though most of the problems are embedded in the structure underneath. Take health care: The Republican House leadership vows to repeal or cut back the recent “government takeover,” which it calls unaffordable. But the unaffordability of American health care – which costs twice as much as care in other developed countries, with worse outcomes – is mainly caused by preexisting programs. In this bureaucracy, every incentive is misaligned. Elaborate reimbursement guidelines encourage expensive procedures, with no incentives for physicians to be prudent. Patients with insurance see health care as an entitlement, allowing hypochondriacs to clog doctors’ waiting rooms. But neither party, we now know after the lengthy debate on health-care reform, will take the political risk of challenging these wasteful practices. 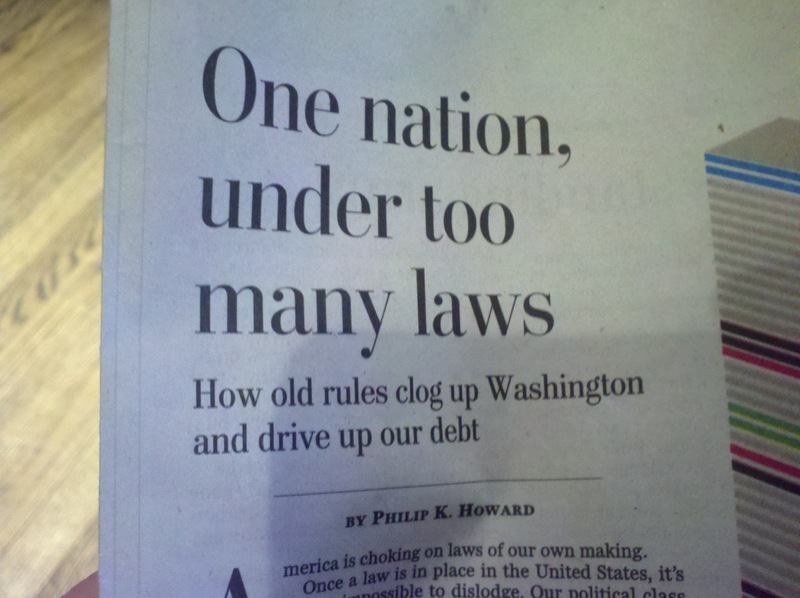 Daily regulatory choices are also immobilized by the buildup of too many laws. The important safeguard of environmental review, for example, has evolved into a kind of perpetual process machine. A wind farm was recently approved off the Massachusetts coast after 10 years of study by 16 different agencies. Now the project is stalled by a dozen lawsuits claiming, yes, inadequate review. Rebuilding this country’s fraying infrastructure is basically impossible, at least in a timely way, because no official has the authority to say “go.” To overcome delays such as these, Congress needs to reconsider how its laws requiring environmental study work in practice. As a former CEO, I think the best option is to adopt a regulatory “pay as you go” system. I am drafting legislation that would require federal agencies to identify and eliminate one existing regulation for each new regulation they want to add. According to the U.S. Small Business Administration, the estimated annual cost of federal regulations in 2008 exceeded $1.75 trillion. The Office of Management and Budget says that the federal government has issued more than 132,000 final rules since 1981, and over 1,200 of those rules have an estimated economic impact of greater than $100 million each. My legislation represents a common-sense effort for a more appropriate regulatory balance. It would require federal agencies to produce a baseline catalogue of their existing regulations and a credible, quantifiable estimate of the economic impact for each one. thanks for the post about an excess of laws. It’s refreshing and encouraging to know that Senator Warner is working to make a difference. Too often we are provided with posturing rather than reality! Thanks, Bookie – it’s a long hard (probably impossible) slog to get our government to represent us again, but it’s worth a shot.